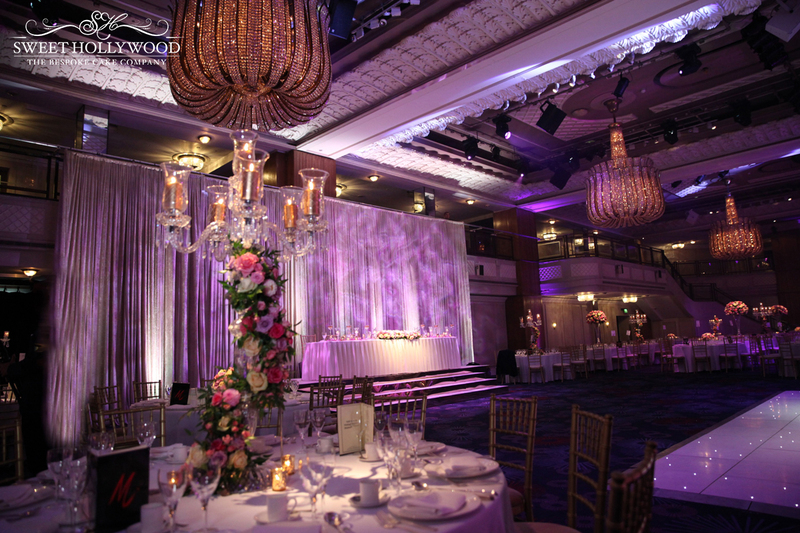 If you’re looking for pure romance on your wedding day, choosing the right wedding venue and wedding suppliers is essential. Your big day is a chance to forget everyday life and immerse yourself in another world of whimsical fantasy for the day, so why not allow your luxury wedding vendors come together and set the mood for an unforgettable wedding reception. 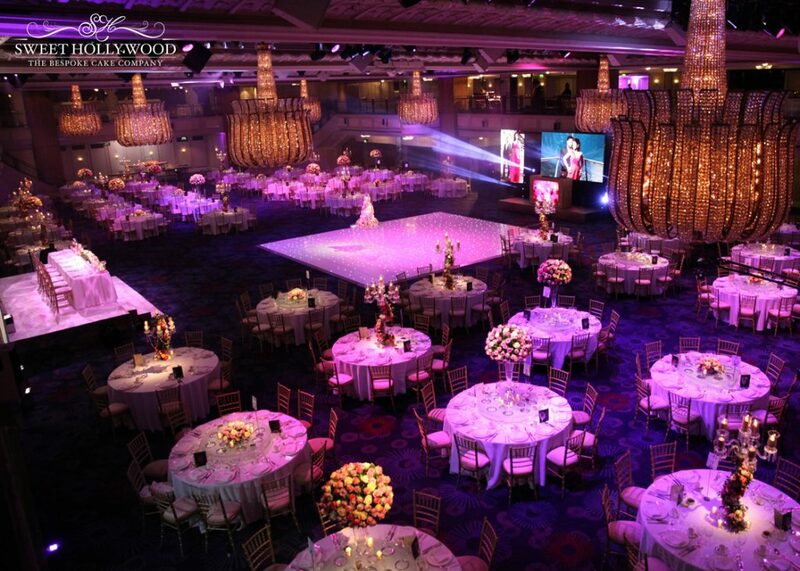 Sweet Hollywood were delighted to offer our bespoke services to our clients looking for a bespoke wedding cake to match the look and feel of their glamorous Asian wedding reception @ Grosvenor House London. 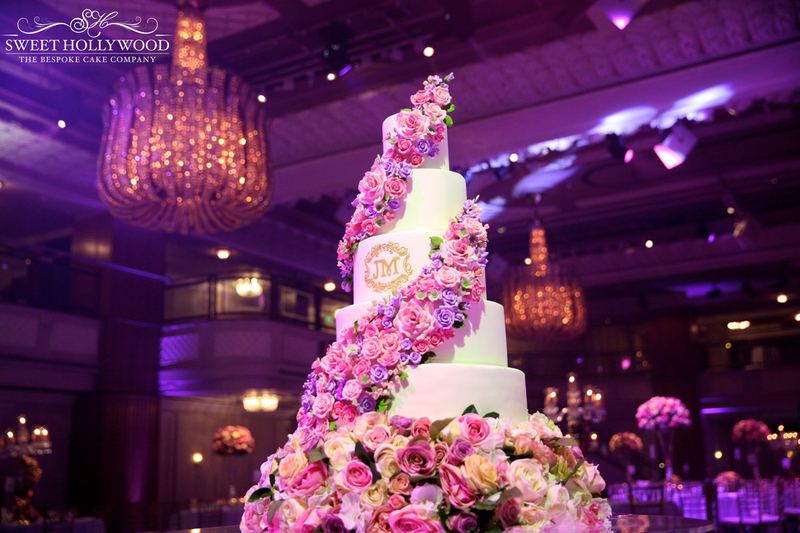 With the above in mind we were delighted to create a grand wedding cake to match the stunning décor that was provided and put together by London based Royal Wedding Services. The wedding décor featured a dramatic full-length draped head table backdrop and soft tea lights and candles to create a romantic atmosphere. 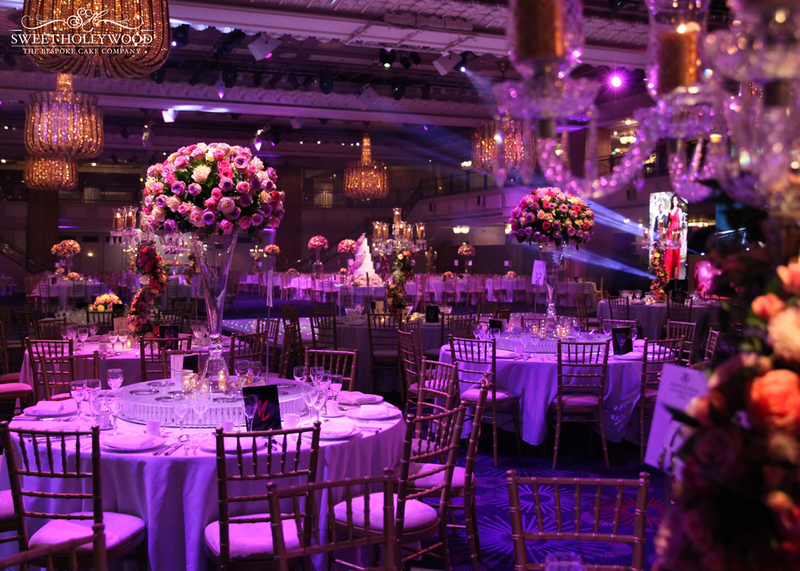 Round banqueting tables featured crystal candelabras, which were adorned with trails of fresh flowers. 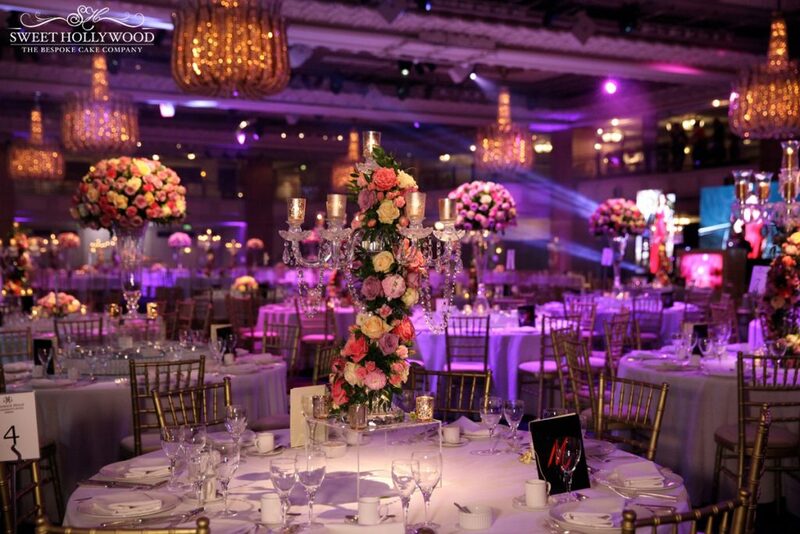 Royal wedding services also put together stunning oversized luxury floral arrangements in large vases that really added to the wow factor. Flowers are a very special part of your wedding day. 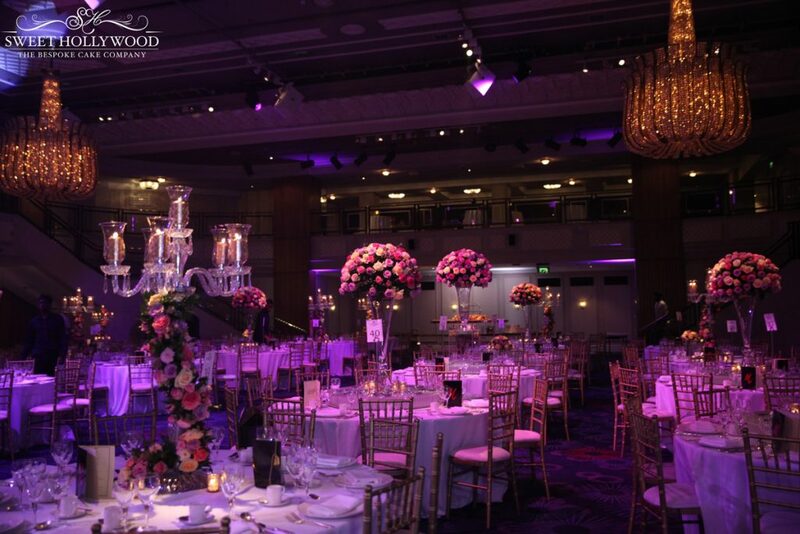 Beautiful wedding flowers play a very important and integral part in making your day special and memorable. 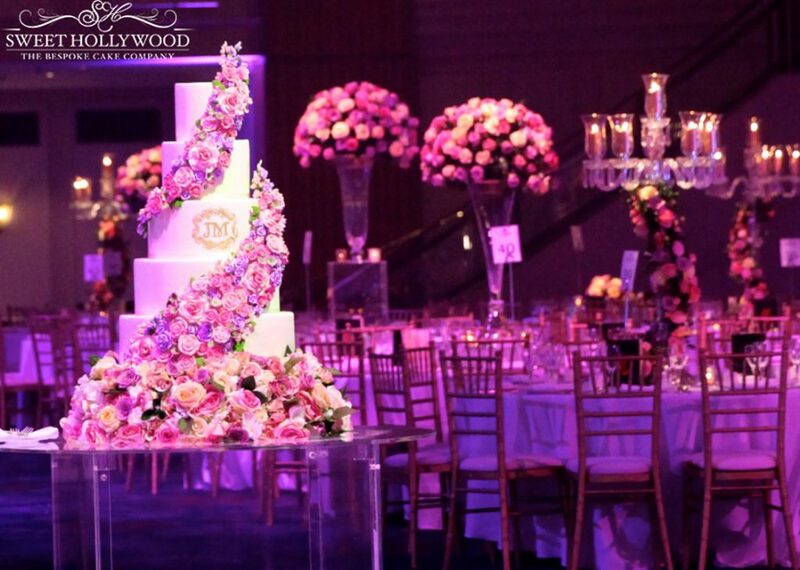 With the above in mind the eggless wedding cake featured five superior sized tiers that gave the cake good presence and featured enough wedding cake to feed over 500 guests. The luxury wedding cake by London based Sweet Hollywood also featured the clients personalized crest and trails of stunning sugar flowers to compliment the wedding flowers. As part of the wedding cake presentation we provided our floating table to finish off the presentation along with an oversized floral base. 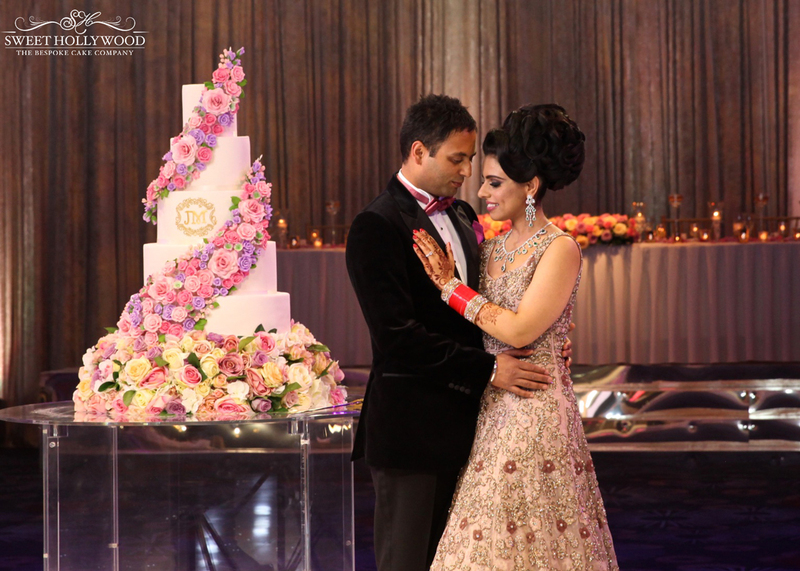 Furthermore we provided a cake sword to add to the drama and magic of the Asian Wedding Reception. With it being a Sikh Wedding Reception our clients had special dietary requirements and requested an eggless wedding cake. The Egg Free wedding cake featured Luscious Lemon and Raspberry Ripple. 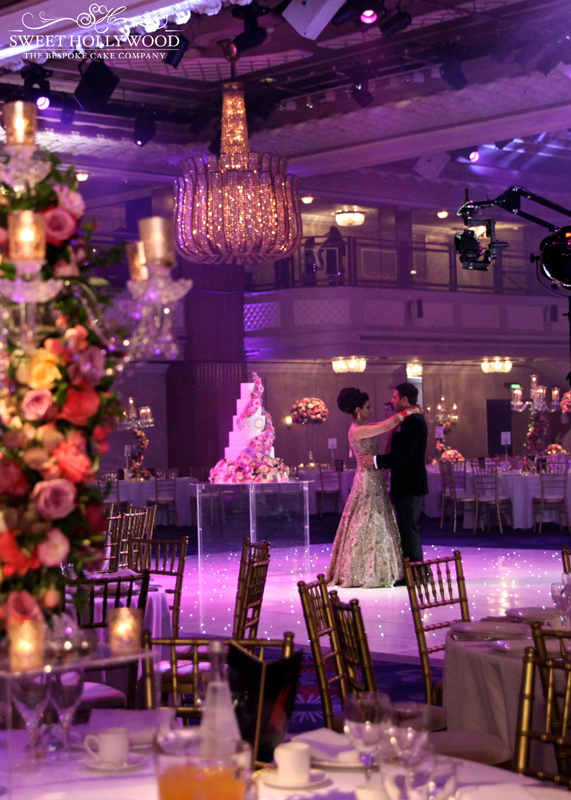 Other Leading London based Asian wedding suppliers included wedding coordination by Opulence Events, Asian Wedding Catering by Madhus, Asian Wedding Flowers & Décor by Royal Wedding Services and Asian wedding Videography by Cineature.